Every smartphone on the market has a specific standout feature. The latest iteration iPhones have the A12 processor, the Note 9's Bluetooth capable S-Pen, then there's the new market arriving Pixel 3 which has the camera capable of capturing some of the best images ever taken on a mobile device. All of the mentioned smartphones in their own right are the best when it comes to digital photography. Then we have the Huawei newest flagship creation, the Mate 20 Pro. It to have an impressive camera, or should I say cameras. Let's take a quick in-depth examination of the Huawei Mate 20 Pro camera specs. On paper, this could potentially be a front-runner for being the best smartphone camera on the market. 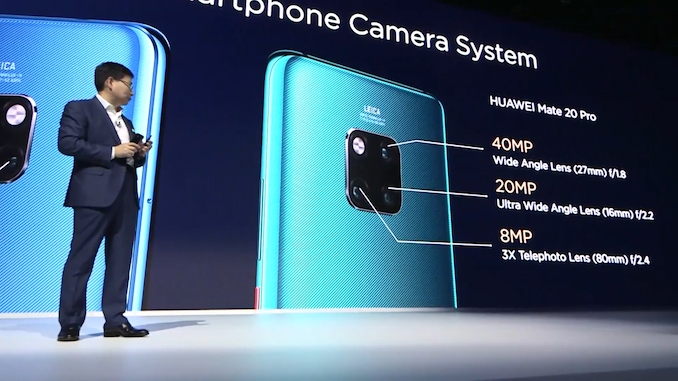 In total there are four Leica cameras on the Mate 20 Pro, one front-facing and three on the rear. Its the rear cameras that has me stoked with interest. We're talking three different focal lengths; you have your wide angle lens, standard within the smartphone industry, an astounding 40-megapixels with a f/1.8 aperture lens. There's the 20-megapixel camera that has a f/2.2 aperture ultra-wide lens that's 0.6 x greater than the wide angle lens than most smartphones granting users an excellent real-world view. Then we have what now is seemingly is standard with most high-end smartphones and that's a is the additional telephoto lens ( 8-megapixels, f/2.4 aperture) whose primary function is to zoom in on subjects without image distortion. The single 24-megapixel front-facing camera has integrated sensors for 3D Face Unlock. The central feature with the Mate 20 Pro camera is AI. Dubbed the "Thinking Lens, " this controls every aspect of the camera, offering a simplified way to capture great images. The A.I will also automatically swap directly to ultra wide-angle lens when A.I is needed, it will even intelligently recognize any primary objects within a camera, keeping it in full focus, and will be able to apply cinematic effects with A.I, shifting surroundings to black and white while the subject is in color. Aside from the impeccable hardware, the digital technology on the Huawei Mate 20 Pro is quite impressive. The fact the manufacturer was able to incorporate four cameras onto makes it even more interesting, each camera having a specific function. How the smartphone camera performs in real-world usage remains to be seen.